I have so many Excel spreadsheets full of data, How can I use Excel Dashboard software with my business? It does not matter whether your question is "How to create dashboard in excel" or "How do I create dashboard using excel" or "How to build a dashboard". The main idea here is to understand the real pain that you want to deal with. 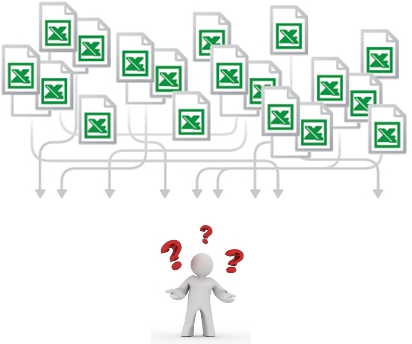 If we re-phrase the question it should be simply "How do I make sense of all the data contained in my spreadsheets?" then you are already coming close and you are not focused on the means. If you are looking to creating dashboard using excel and within an excel file, then we would advise you stop that thought process and carefully read about the dangers of this approach in the following paragraphs. end up with any of the below problems. All of the above are serious issues in themselves. We have seen customers come to us with huge excel files with upwards of 20 worksheets filled with lookups, pivot tables, calculations and everything excel has to offer. The same file also contains additional worksheets with charts and summary data that they call it excel dashboards. The brave analyst had put this dashboard when her boss requested for a dashboard and slowly it got bigger and messier, undocumented macro formulas, no checks on the validity of the calculations and finally the biggest problem of all was that this whole cycle of tasks became the only duty of this analyst. How? - Use Excel only for storing your data. Nothing more. Do not build any visualization in the same place where your Data resides. In short, your excel files should contain only the data. Save Time - Just build the dashboard presentation layer only once and automate the refreshes. Excel dashboard definition : It is a visual interface that provides at-a-glance views into key measures relevant to a particular objective or business process. A dashboard consists of three key attributes. Displays data graphically (such as in bar charts, sankey, circle pack). Provides visualizations that help focus attention on key trends, comparisons, and exceptions. Contains predefined conclusions relevant to the goal of the dashboard and relieves the reader from performing his own analysis. InfoCaptor excel dashboards perfectly aligns with your requirements to aggregate data from multiple csv and excel files. We have this extremely detailed step wise tutorial on how to create your excel dashboard. The tutorial will guide you on how to prepare data and how to analyze, create charts and finally publish into a web based dashboard. 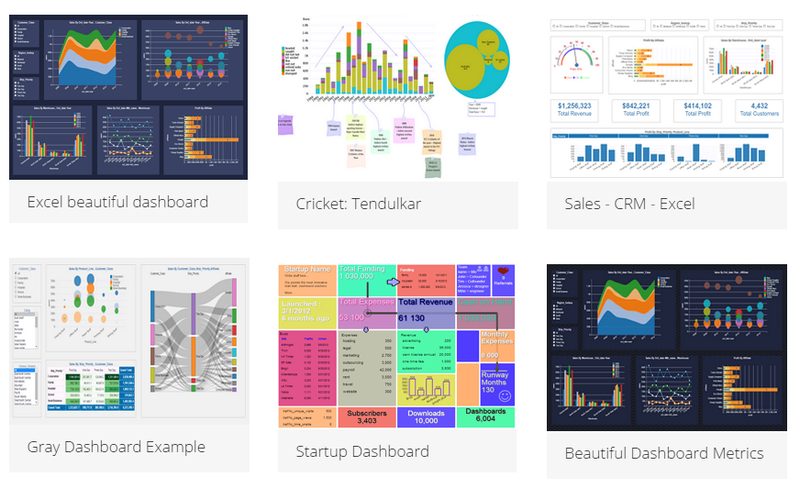 You can see some of the Excel dashboard examples below.